United States Flag *** Everything you need to know! The United States Flag is recognised throughout the world as an instantly recognisable symbol of the United states and its citizens. The United States Flag represents the culture, values and the pride of America. Our articles on the United States Flag reflect the respect shown to this important emblem of America. Each article is illustrated with pictures and images and cover important facts and information about the history, the sizes and dimensions, rules, etiquette and protocol. How to display American flags and the disposal of worn flags is also covered together with the Folding the United States Flags and the symbolism and the meaning of the folds. "No disrespect should be shown to the American flag of the United States of America". The Flag of the United States is one of the most important National emblems of America. The United States Flag is also referred to as the Stars and Stripes, Old Glory, Red, White and Blue and the Star Spangled Banner. The article on the American flag contains interesting facts, information, history and trivia about the American flag together with details of the color symbolism and the stars and stripes symbols. Recommended reading: Star Spangled Stars History. We have included some unusual pictures and images the United States flag which feature pictures and images of Old American Flags such as the First Grand Union banner, the Hopkinson, the Betsy Ross and the Star Spangled Banner with fifteen Stars, our vertical pictures and images are unusual depictions as are the images and pictures of American flags that are have unusual shapes and designs. The article on American Flag Dimensions provide the sizes and specifications of the flag and ensures that the Stars and Stripes are all correctly proportioned and the correct size. We even have facts and information about Flag Poles. The sizes of flags are determined by the height of the flagpole (flagstaff) from which it is flying. The United States Flag must be in proper proportion to the size of its flagpole and it is therefore vital to check flagpoles with the sizes of flags. Check out the correct sizes and dimensions with interesting facts and trivia about flagpoles. The United States Flag Etiquette is extremely important and US Federal laws stipulate rules and protocol to ensure that due and proper respect is given to the most famous symbol and emblem of the United States. This article provides information and guidelines in relation to giving respect by adhering to the United States Flag etiquette. 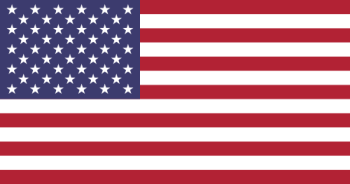 The United States Flag rules relate to the use and display of the American flag was made law on December 22, 1942. The rules and protocol give useful guidelines in respect of advertising, embroidery, printing, costume, advertising signs, patches, lapel pins, markings and the disposal of worn flags. The Display of the United States Flag relates to rules regarding displaying flags in the rain, at night, in a classroom, in church, at home, outdoors, vertically and with State flags. In fact everything you need to know about displaying the United States banner. The correct way of folding the United States flag involves 13 folds, each of which has been ascribed a highly patriotic meaning. The symbolism and meaning associated with the 13 folds during the ceremony of folding the American Stars and Stripes are fully explained in this article. The National Flag Day is celebrated every year on June 14th to commemorate the birthday of the American banner which was established by the Continental Congress on June 14, 1777. This interesting article on Flag Day provides facts, trivia and the history of this yearly patriotic observance. The customs and traditions of flying flags to commemorate special people and significant events in the history of the USA plays a major part in the lives of Americans. The holidays are the dates and days designated for observing the traditional customs related to the display and flying of the Stars and Stripes. A definition and facts about the history and origins of the holidays are also provided. The words are also translated into Spanish, German and French together with detailed meanings of the words. The recitation of the Pledge of Allegiance is accompanied by the hand-over-the-heart gesture as the salute to the emblem of the United States of America. The familiar hand-over-the-heart gesture is another of the well known Stars and Stripes. The Proper Disposal of United States Flags is mark of solemn respect for all that the emblem symbolizes. Helpful facts and information about the safe and respectful disposal by burning and ideas for a retirement ceremony that can include members of the family. The United States Code is the official compilation of the general Federal laws compiled by the Office of the Law Revision Counsel of the United States House of Representatives. The official United States National symbols detailed in Title 36, Chapter 10 and Chapter 3 of the United States Code. Title 36 consists of Patriotic and National Observances, Ceremonies, and Organization and Chapter 3 details the National Anthem, Motto, Floral Emblem, and March.